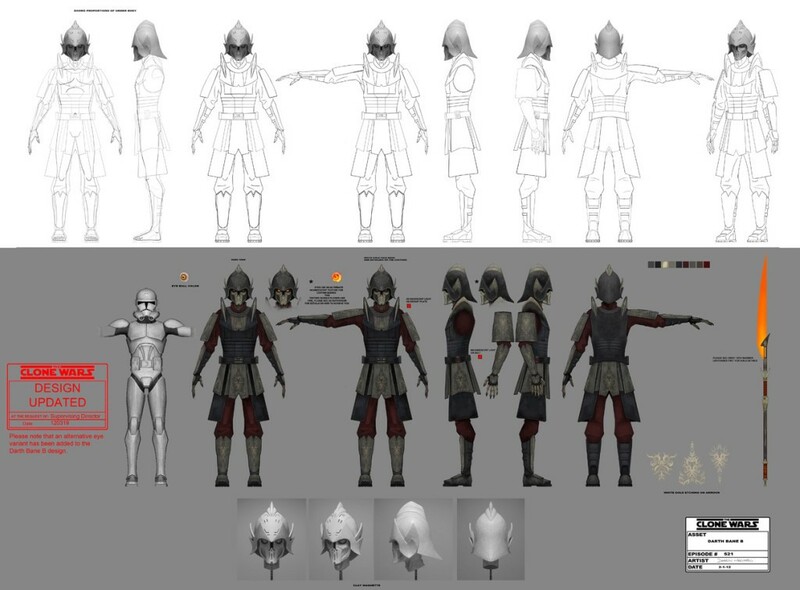 Does Star Wars: Episode VII have a link to Star Wars: The Clone Wars’ Yoda arc? I present a scenario to you. A possibility. The Lost Missions. You’ve been warned. Mark Hamill is Darth Bane in Star Wars: The Clone Wars. Mark Hamill is Luke Skywalker in Star Wars: Episode VII, allegedly. Last night’s premiere of Star Wars: The Clone Wars brought us 13 unaired episodes. The final arc of the series had huge ramifications for the universe. It presented some of George Lucas’ final stories set in the Star Wars universe. These stories were being constructed in the 2011-2012 timeframe based on concept art. During this time, George Lucas decided there would be a sequel trilogy. His thinking from this time and his creative energy is probably somewhat reflective of where he stood on the cosmos of the Star Wars saga as he refined the final sequel trilogy treatments he would pass on to Michael Arndt and then onto Lawrence Kasdan and J.J. Abrams. So lets speculate a little more. This will in all likelihood look silly in the future. But I’m just playing the hand I was dealt last night, so to speak. In Star Wars: The Clone Wars, Yoda seeks out the planet that is the start of the Force in the Galaxy. There he meets five beings who send him on a trials to learn the path to immortality that will save the day eventually. 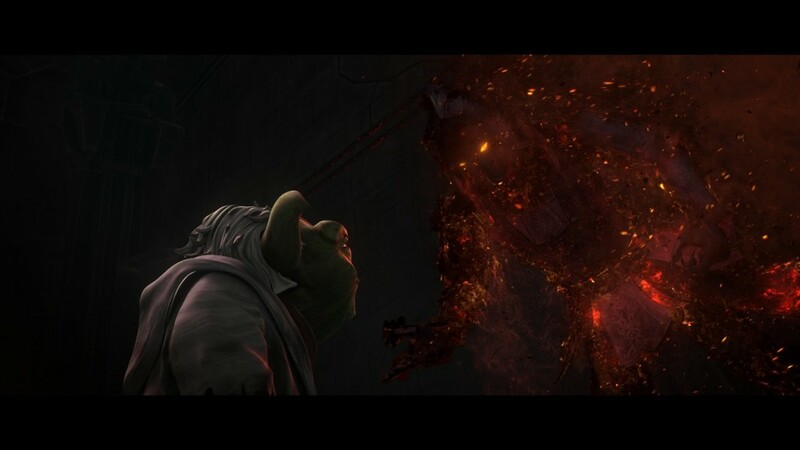 Yoda is sent to Moraband, the origin planet of the Sith to confront his demons, so to speak. The ghost of Darth Bane confronts Yoda and asks if he has come to become his apprentice. Yoda rejects him. Bane says only when Yoda kills him will he be the master. Yoda then says Darth Bane is already dead. But the point is the spirit of Darth Bane is accessible. What if a pupil of Luke Skywalker wants more power, knowledge, or skills like that of Yoda? What if life after death is a known possibility to the Luke Skywalker pupils? Yoda’s pupils all believed it was impossible and scoffed at the notion, until Qui-Gon, Yoda and Obi-Wan Kenobi achieved it, but by that point, Yoda’s pupils where all dead. So what if Luke’s pupils know about this power? What if one of Luke’s pupils goes on the quest to learn the life after death method? But what if he accepts Darth Bane’s offer? What if he does the opposite of Yoda? What if Darth Sidious is there? Wouldn’t the interactions with those spirits be enough to start a new Sith tradition that threatens peace in the Galaxy? The Clone Wars is canon. The stories originate from George Lucas. There could be something there. Interestingly, Mark Hamill could then play Luke Skywalker and Darth Bane in Star Wars: Episode VII.